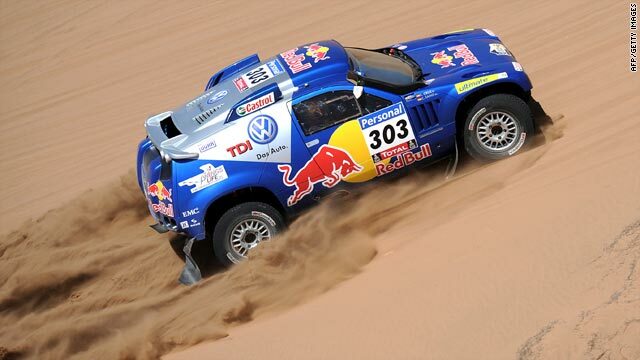 Two-time world rally champion Carlos Sainz is seeking his first overall victory in the Dakar race. Carlos Sainz is closing on his first Dakar Rally car title after extending his lead with victory on Tuesday's 10th stage in the South American event. (CNN) -- Carlos Sainz is closing on his first Dakar Rally car title after extending his lead with victory on Tuesday's 10th stage in the South American event. The Spaniard, who led last year's race before crashing out on the 12th stage, was 10 minutes and six seconds ahead of Volkswagen teammate Nasser Al-Attiyah of Qatar after triumphing on the 238-kilometer leg from La Serena to Santiago. It was the two-time world rally champion's first stage win in this year's event and the 16th of his career, and leaves him in prime position to win with three legs to go. Al-Attiyah finished the day in fourth as he lost one minute and 40 seconds to Sainz, but was still more than 18 minutes ahead of third-placed American Mark Miller in another Volkswagen. Miller was third on the stage, with Frenchman Stephane Peterhansel second -- 28 seconds behind Sainz. Peterhansel, who has won six motorbike titles and three in a four-wheeler, is more than two hours behind Sainz in fourth place in the overall standings. "Eighty kilometers after the start we caught up with Nasser," Sainz told the race's official Web site. "We stayed behind him because he couldn't hear the Sentinel and we couldn't get past. "It was quite a slow and winding route, mostly lanes. What I did first was to get close to Nasser, then I stayed around at 1:40. After that, from the 80km point onwards, we were driving in the dust." Al-Attiyah, who won the ninth stage, said he struggled after having to lead out the field. "It was very dangerous at that speed. There were a lot of corners, a lot of slippery stuff. For me it was not a good feeling and I'm really happy to have finished this stage without any problems," he said. "Today it was very stressful because I opened the road. Tomorrow there will be some off-road and more dunes. It will be good for me." Peterhansel's compatriot Cyril Despres leads the bike class by one hour, 22 minutes and 49 seconds despite finishing only sixth on Tuesday. Spain's Marc Coma, also riding a KTM machine, won the stage by more than two minutes from another Frenchman, David Fretigne, but is way back in 17th overall. Russia's Vladimir Chagin is more than an hour ahead in the truck class after following up his stage win on Monday with another victory. Wednesday's 11th stage sees the race move from Chile back into Argentina.